This week we’re featuring another of the mainstays from the PSAdmin.io slack community – Brad Carlson. He is a regular in the community and another member of the seemingly endless ‘PeopleSoft Minnesota Mafia’. Brad is a frequent guest on their PodCast talking about his IB Monitor tool and discussing the highly efficient application of CPU patches. I’m thrilled that he has added his profile to our ‘How I Work‘ series. Current mobile devices: Samsung Galaxy s5. Yes, it’s old, but it still works. TOAD and SQLDeveloper for sure. Each has their strengths. It’s nothing fancy, but it works for me. I’ve got a space for my Surface, a 24” Dell monitor as my primary screen, and a 10+ year old 17” Dell monitor to the side which hasn’t been turned on in a very long time. My cube walls are plastered with pictures of my wife and son, along with various artwork my son has produced over the years (DD: plus a picture of Bill Murray, it seems!). It’s a bit cluttered at times, but I try not to let it get too out of hand before I straighten things up. Almost anything, except Country. I have playlists that range from Bach to Fleetwood Mac to Slayer, sometimes even in that order. You’ll find lots of Metal (Megadeth, Metallica, Slayer, Linkin Park, etc) and Industrial (Ministry, NIN, etc) bands in my music collection, and I find those keep me energized at work. I’m also a big fan of Rob Scallon’s unique covers, and will stream some of those from YouTube periodically. What PeopleSoft-related productivity apps do you use? Honestly, I am not in App Designer much anymore. I still use Change Assistant and Data Mover occasionally. Most of my admin work would be more on the server side, so psadmin is a frequent tool. When I wear my DBA hat, I spend most of my time in TOAD, SQLDeveloper, and OEM. Sorry… I guess a Haiku is 3 lines. It might sound crazy, but I love tuning SQL. If we have performance issues with code, I’m usually game for taking a look. I enjoy writing SQL/scripts to automate common tasks. We’re really into automation here at the University of Minnesota. A personal favorite was building a process to refresh a full PeopleSoft environment by issuing a single command. I also try to find time to build tools, like the IB Monitor, to help the teams here. I tend to gravitate to Java for those. Even though I don’t use the tools much anymore, I’ve been wondering why PeopleSoft hasn’t moved the Application Designer functions into the online application. Being me. Hands down. It’s not as easy as it might look. How do you keep yourself healthy and happy? I still play hockey twice a week (all year) as a goalie. I also enjoy bowhunting and going to the archery range with my son. In fact, it’s that passion which led to my writing an application for hunters (GameTracker: The Hunting App on Android and iOS). Developing that was a fun learning experience. Travel with my wife and son also keeps me pretty happy. We typically do a vacation each year, and it usually involves the outdoors/hiking. At home, we have a koi pond in our back yard. The sound of the waterfall, and the tranquillity of the pond are very relaxing. My dad always told me, “Work with your brain, not your back”. 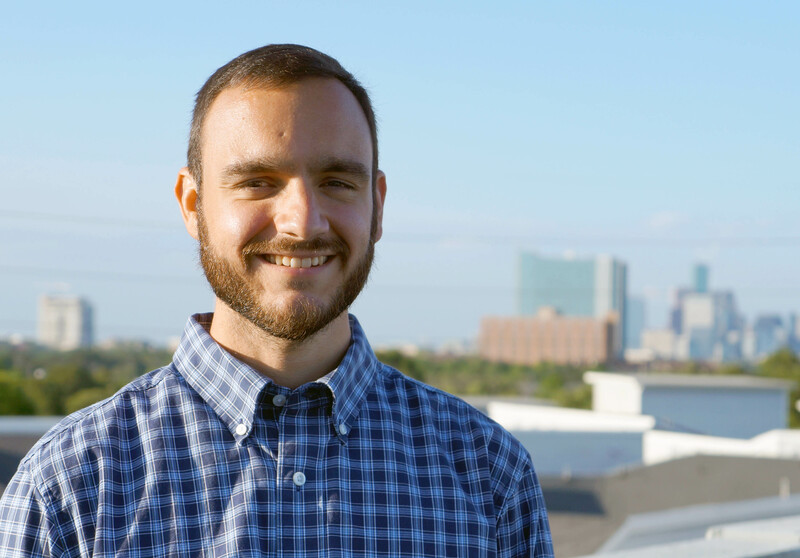 This week we’re featuring another of the mainstays from the PSAdmin.io slack community – Charlie Sinks. He is a regular in the community and a frequent guest on their PodCast giving UMRUG recaps and discussing automation. He also presented at the inaugural PSAdmin.conf on Implementing Rundeck with PeopleSoft (the recording is available here and is well worth an hour of your time). I’m thrilled that he has added his profile to our ‘How I Work‘ series. At work: Dell Latitude E7470 laptop running Windows 10. PeopleSoft Deployment Packages (DPKs) and Puppet – I can’t even imagine deploying PeopleSoft environments and maintenance the old way anymore. It’s easy to get hung on the things we wish the DPK did better, but it really opened the door to automation in the PS Admin world for those of us who weren’t already using Puppet, Ansible, etc. Rundeck – the ability to execute tasks – from simple commands to complex orchestration – on any number of remote servers has helped us go a long way towards automation. For example: single-click CPU patching on all of our non-Production servers at the same time. Even for simple service restarts, it’s so much easier to do it from a dashboard in Rundeck. BeyondCompare – It’s crazy how many file formats this thing can compare. Best compare utility I’ve come across. Dashlane – password manager with great browser integration for website accounts. Not as great for any other type of account. For that, see above. Notepad++ / Visual Studio Code – For years I swore by Notepad++ because of its great plugins, macros, and language support. I still think it’s great, but I just discovered Visual Studio Code. That has everything I like about NP++ plus more. Much more streamlined extension and language support, themes, and its integration with Git is phenomenal. And it lets me turn on Vim keymapping with a single keystroke! I have a new favorite now. MobaXterm – a nice upgrade from using a terminal like PuTTY for administering Linux servers. I haven’t begun to use all of the features this tool has, but I was quick to discover that it comes with a suite of simple games. I’m not really sure why… but it’s best not to question some things. My coffee-maker. I use an Aeropress at home, and a French press at work. I always have a coffee mug in my hand. I may have a problem. If I’m being honest, a bit messy with Post-It notes all over the place and the occasional coffee-mug ring décor. I write Post-It notes to remind myself of all sorts of things and try to put them in obnoxious places where I can’t ignore them. Yet I still manage to ignore most of them… I guess I’m so good at tuning things out that I can’t even trick myself. Blues, jazz, electronica, old-school hip-hop, skiffle – it really depends on my mood and what type of work I’m doing. A lot of Tom Waits lately. Change Assistant (for our internal releases in addition to the rest of it), DPKs, and puppet. I also like the Chrome extensions PS Utilities and PSChrome. When you’re developing or testing, instead of clearing your cache hit Ctrl+Shift+N in Chrome to open Incognito mode. That was one line, can I do another one? If you’re newly upgrading to PeopleSoft 9.2, take some time to build out some navigation collections and homepage tiles. It’s really easy, will make your life easier, and will impress your end-users. It’ll also limit how often you have to use the new Nav menu… ick. Open-source development! At least for the DPKs. Come on, Oracle. Let us fix the things we complain about so we can stop bothering you about it. No matter how good you are at something, there’s always somebody who’s better at it… so this is hard to answer. I do have a really high tolerance for eating extremely spicy food. Spending time with my wife and three kids, reading, and getting out in nature. This week we’re featuring another of the ‘leading lights’ from the PSAdmin.io slack community – Wayne Fuller. He is a regular in the community and a frequent guest on their PodCast discussing running large scale PeopleSoft while at Wells Fargo (amongst other places). He also presented at the inaugural PSAdmin.conf on The Future of PeopleSoft Administration (the recording is available and is well worth 30 minutes of your time). I’m thrilled that he has added his profile to our ‘How I Work‘ series. Any app that I can learn quickly that saves me time, i.e. Beyond Compare etc. My refrigerator. It keeps the beer cold. Also my Kindle because you have to have something to read while you are sipping a beer. Just a small open cube when I actually go into work. Since I am part time I don’t have a permanent workspace. When I work from home I sit at the kitchen counter. Is Change Assistant a productivity app? How about the images? Integration Broker? I know, event mapping. MOS actually can answer questions. Sometimes you just have to read between the lines. Code to query PeopleTools tables to discover where and how some of the new objects are stored. Useful for behind the scenes compares. Pretending that I am good at troubleshooting by using Google search. I work 2 days a week and don’t think about work when I am at home. Never be afraid to give your opinion on something you are expert in. You likely know better than your boss as you are the one who works with the stuff daily. He should value, nay require your opinion on things that you do. To anyone who frequents the PSAdmin.io slack community (and that’s almost 500 people) the name Jason Fletcher (or fl3tchr) will be one that’s instantly familiar. He is not only seemingly ever-present, but also dishes out rapid-fire PeopleSoft advice, humour, gifs and good-natured sarcasm in more-or-less equal measure. I’m thrilled that he has added his profile to our ‘How I Work‘ series. 1) Beyond Compare – So much better than Compare Reports. So much. 2) EditPad Pro – It’s been my text editor for over a decade. Handles gig sized files without much issue. 3) OneNote (Office version, not MS Store) – a great way to track notes on various projects. A notebook for a project, a tab for a milestone, and pages for individual tasks. The MS Office version has the ability to drag and drop text anywhere on the page, which is great for floating notes. None. I’ve been accused of loving my computer more than my wife. Workstation is an i7 with 8 GB RAM and docked to 2×24” monitors. Yes, it is a nice view. 1) Slack – psadmin.io. It’s like a responsive MOS. 2) SQL Developer is my go-to SQL client. 3) Oracle Enterprise Manager for troubleshooting database performance. I’ve put this one in psadmin’s slack: in Windows Explorer, typing cmd (or powershell) in the address bar opens a command prompt at that location. A lot of effdt/seq SQL or SQL that joins psoprdefn & psroleuser. git or some other integrated versioning system. I’m currently a 1 gup in taekwondo (red belt with black stripe), which is the first rank below a 1st degree black belt. The outdoors are great in New Mexico most of the year so I do quite a bit of hiking. At nights I spend a lot of time playing Overwatch. Love the Lord God with all your heart and soul and love your neighbour as yourself. Posted by Duncan in OOW. Larry Elison came on stage last night to pumping rock music and laid out the details on Oracle’s latest big product unveilings – Oracle Autonomous Database and Highly Automated Cyber Security. Wearing a black polo shirt, faded blue jeans and a pair of ASICS running shoes he was relaxed and candid, obviously talking in an area that is comfortable for him. This session was mostly on the Autonomous Database, however Larry spent some time striving to convince us all that the safest place to store your data is in an Oracle database – where they do everything they can to prevent human intervention, and therefore the risk of human error. The upcoming Cyber Security product – the subject of his Tuesday keynote – is designed to detect threats when they first occur, and then handover to the database to automatically apply patches rather than wait for humans to notice the breach, schedule downtime and then implement new security measures or patches. He made the point that the worst security breaches in history were made after the patches to fix the vulnerability being exploited were available – the issue was that the patches weren’t applied. Much of what he said must be ringing in the ears of Deloittes after their cyber leak– where the breach went unnoticed for months and lax security processes allowed hackers to easily access customer data. It seems that much of the cleverness behind these advances is machine learning, where the system watches events and looks for patterns that do not fit normal usage – e.g. someone logging in through an IP address on the TOR network, or from an unusual country. Larry claims that the new 18c Autonomous Database reduces 100% of the human labour needed to run a database – it automatically provisions, upgrades, patches and tunes itself while running. The SLA guarantee is 99.995% – meaning less than 30 minutes downtime a year (planned and unplanned). Adding to this, he added that it would run at 50% of the cost of Amazon and that Oracle would write that into your contract. The database is called 18c due to the calendar year, however the data warehouse version will be available in Dec 2017, with the OLTP database coming in June 2018. Larry then continued with several examples of Oracle pricing being cheaper than AWS due to Oracle’s faster processing (both Oracle on Oracle Public Cloud vs Oracle on AWS and Amazon’s DB on AWS)… “If you want the extra security, if you want the extra automation that Oracle provides, you’ve got to be prepared to pay less.” Of course vendor produced comparisons should always be treated with a level of scepticism, however if Oracle are willing to write the savings into your contract then that does underline their claim. Posted by Duncan in Cedar, SelectiveAdoption, UKOUG, UX. While Marc was demoing some new functionality it struck me how big a stride the PeopleSoft UI has taken over the last few years. If you’d shown me this picture a few years ago I’d have refused to believe that it was PeopleSoft. Very few applications can boast a UI as attractive as this. Julie Alonso showed this slide, detailing how many customers are really making the most of Selective Adoption. You might need to click these to see full-size, but let me highlight the key point. The right-hand pie-chart shows that 31% of customers are ‘staying current’ – i.e. doing a get current 4 times a year! A further 25% are getting current twice a year. So more than half of customers are getting current at least twice annually. I think this is really tremendous take-up of the benefits of Selective Adoption – and the PeopleSoft team must be delighted. I had fully expected most customers to lapse into an annual update. Posted by Duncan in PeopleTools. 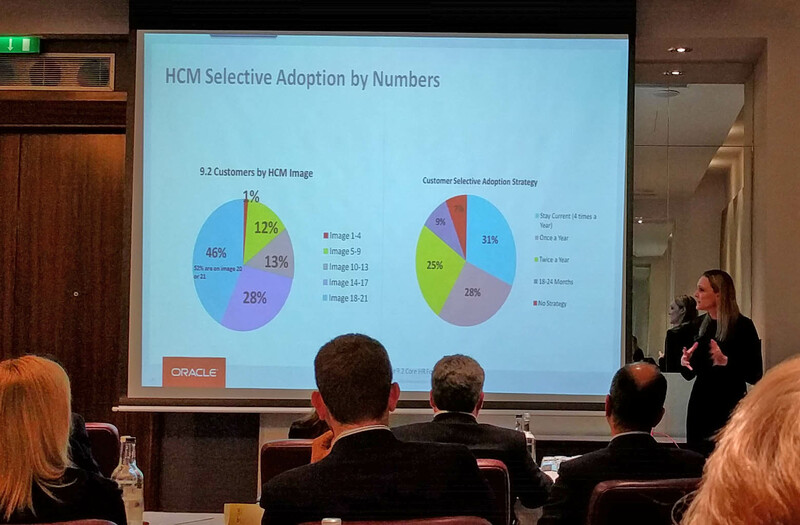 Two great events took place at the end of April – the UKOUG PeopleSoft Roadshow and the annual Cedar PeopleSoft Executive Dinner. 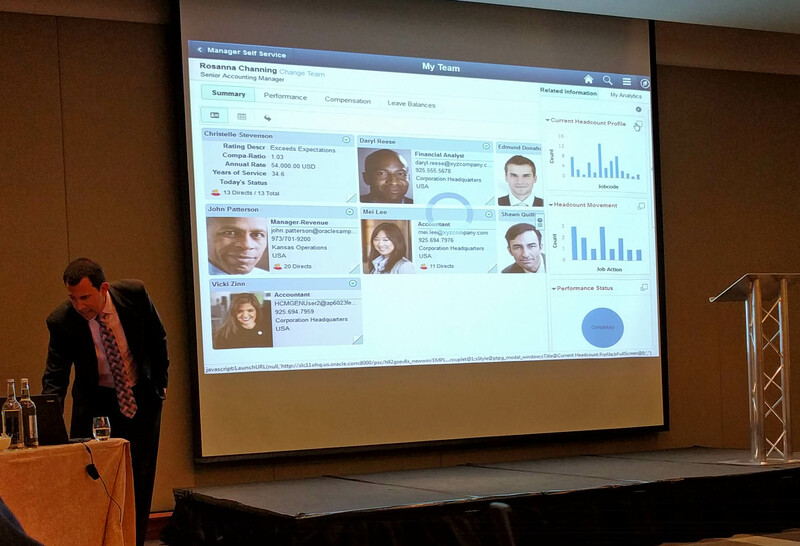 Marc Weintraub and Julie Alonso spoke at both events so I’ve combined the highlights into a single post covering PeopleSoft improvements (including the new Onboarding module), PeopleSoft customer numbers looking strong, extension to the Support end date and more. The full post can be found on the Cedar Consulting blog, here. Posted by Duncan in UKOUG. The UK Oracle User Group PeopleSoft Roadshow is nearly upon us. It’s my favourite PeopleSoft event in the UK’s calendar as you know that everyone there has a focus on PeopleSoft and the agenda is always really strong. It’s 26th April (yes, a week today!) in the Crowne Plaza, London – the same as last time, which was a great venue. In terms of Oracle speakers, we’re spoiled this year with both Marc Weintraub and Julie Alonso presenting. Pretty much everyone should know Marc by now, and he’s always good value. He’s giving multiple sessions including a PeopleSoft Update, Modernising with Fluid, Fully Executing on Selective Adoption and PeopleSoft in the Cloud. A new speaker to those who’ve only attended UK PeopleSoft events is Julie Alonso. She is Product Management Director within PeopleSoft HCM Strategy and the brains behind the monthly PeopleSoft HR Newsletter (if you don’t know what this is, either see Julie on the day or drop me a mail and I’ll link you up). Julie is presenting on The Power of PeopleSoft HCM. It’s great that Oracle are supporting the event with two such speakers, and it’s wonderful to see a new face on the circuit. We’ve also got a couple of speakers from Cedar on the agenda. As with Marc, everyone should know Graham by now. He’s a rare blend of techie that’s been around PeopleSoft for long enough to know the history behind just about everything, but has such fantastic enthusiasm that he’s always trying the latest tools and techniques. Graham is talking about Selective Adoption and the Oracle Cloud. For those with excellent memories, Sarah has spoken at a PeopleSoft conference before (on a custom recruitment front-end that Cedar built for a client) however that was a few years back. Sarah has been busy managing some of Cedar’s PeopleSoft projects in the interim and is giving learnings from a Fluid implementation for a client – Fluid Development – Getting to Grips with a Different Skill Set. Check out the agenda for the full listings, but in addition to the above we’ve got Paul Smit from Oracle Netherlands, Malcolm Hewlett from Excel4Apps and Ken de Landro talking about Hays’ automated PeopleSoft testing investigations. If the above sounds like the sort of content that would interest you – and there’s something there for pretty much everyone – it’d be great to see you there. Book here. The next profile in our ‘How I Work‘ series is Colton Fischer. Colton is one of the crop of new PeopleSoft bloggers bursting on the scene during 2016. His PeopleSoft Mods blog is a treasure trove of great content and if you’ve not been there before it’s worth scrolling back through Colton’s historical posts – as he doesn’t just look at existing delivered functionality but extends PeopleSoft in ways that it’s clear to see the business benefit, frequently explaining how you can get the same results. I’d have to say my coffee maker. That thing gets me through each morning because I don’t know what I would do if I didn’t have my coffee. I would say that my workspace is pretty basic. I will admit that it is not normally as clean as it is in this picture. Most of the work I do happens on my desktop computer. I use my laptop for running personal demo systems to do “experimental” development on. I also use the systems on my laptop when I do development that requires constant app and web server bounces so that I don’t bother anyone else. I enjoy most all genres of music, but what I listen to while I work relies heavily on the type of work that I am doing. If I am doing something that requires me to think hard, I listen to soft acoustic guitar songs. If I don’t need to think too hard, then I mostly find myself listening to metal rock, punk rock, and occasionally dubstep. I have App Designer, SQL Developer, and Chrome windows open at all times. I like to use Chrome add-ons or other web-based productivity apps. I use Advanced REST client for Chrome when I need to work with web services. When I need to quickly view some unformatted XML, I use an online XML viewer to format it for me. I often work with base64 encoded values, so I use an online base64 decoder to obtain the decoded values. I also use the Chrome DevTools to view the source behind fields on PeopleSoft pages. I am not sure how well-known this is, but I recently discovered that meta-HTML can be used in the message catalog. Using meta-HTML (or even regular HTML) in messages can allow for some cool configuration-based functionality. I usually write queries on the security tables that deal with roles and permission lists. However, here lately I have been writing some queries on the PSACCESSLOG and PSPTLOGINAUDIT tables. There is some really interesting information in these tables from a security perspective. I would like to see some built-in functionality to make it easier to identify sensitive data (bank account numbers, SSNs, etc.) fields in PeopleSoft. It would be nice if the field definitions that are used to store\display sensitive data would have a setting to distinguish the level of sensitivity. Having this information stored in the meta-data tables would allow for the ability to easily write queries to determine where in the application sensitive data is being exposed. This would, in- turn allow for PeopleSoft security administrators to more effectively secure their PeopleSoft applications. I am not sure if I am better than anyone at this, but I am good at time management and not procrastinating. I enjoy playing golf and tennis when I have someone available to play with. When I am solo and I want to do something physical, I usually go skateboarding. Something else that keeps me happy (but not so healthy) is playing Xbox. The best piece of advice I’ve received is to start each day fresh and with a clean slate regardless of how the previous day went. It’s easy to carry struggles and frustrations with us from day to day, but it only hinders your productivity and outlook. There’s no plan on ending support for PeopleSoft then, it’s actually not that important a date. It happens to be the date right now that our lifetime support goes to … that probably won’t be the case and as we get closer to that date the plan is to move those dates out. For me investment and support are one and the same. It’s hard to support applications without continuing to enhance them as well. We’re planning to support and enhance them through that date. We have 2-300 customers who are live on it, and many of whom aren’t live with just a few applications but with Fluid across the board. We’ve got to that hockey stick period in terms of adoption where the majority of our customers who are doing projects or upgrades are deploying Fluid.